An accounting instructor threw a scary thought at me. He said all companies should keep two sets of books. He was a very honest man and wasn't implying that companies should be defrauding the government, but in fact that the government requirements didn't go far enough to understand a business to make the best decisions to improve profit and long term growth. What has this got to do with you? It depends. If you are in business you are always planning which includes executing your plans and getting feed back. A good business man understands that to neglect proper planning is to jeopardize your future. New Years Day is usually the beginning of many a plan. Instead of January my choice is September. The key factor is that is when kids go back to school. As a parent with two kids out of school I no longer revamp my life the way I used to when school forced a change in routine. But really no body escapes it. Summer holidays are when most families take time off together and the rest of us find it difficult to connect with our customers and suppliers. As a salesman I am busiest in the spring and the fall. In winter it seems customers are recovering from Christmas shopping, discouraged by the weather from any unnecessary shopping and a few lucky ones are beyond my reach in some sunny climate. The summer is not quite as slow, but it seems frustrating in that many of the people I want to contact are on vacation, just back from vacation (and catching up), too excited about their upcoming vacation or their support staff (or their boss) is on vacation and they are stretched. Rather than be frustrated I look forward to the upcoming busier season--everyone back from vacation, stores ready to re-stock and new opportunities. A new beginning. Just like when I was a student or my kids had to shift their attention from vacation fun to serious study (and meeting old and new friends also making the shift). Planning is really being done all year, even if not written down on paper. Measuring ourselves, establishing goals and strategies are ideally done on a time frame. While the government requires you to pay taxes based on a calendar year, your own arrangement of time might work better with your own calendar. If you haven't thought about it one of the advantages of setting time based goals and strategies in your time frame, is that it is really a beginning of your choice. A chance to throw out the things that didn't work and concentrate on new strategies that promise more success. You will have to make adjustments at different times of the year, but a major shift of thinking is worth while and you can decide the beginning time and the measurement time. At a networking meeting I was introduced to a book written by Bob Burg and John David Mann, "The Go-Giver." Following my initial impulse I was able to quickly borrow the book from the library and found it to be a quick read. A quick read doesn't mean there isn't potentially life changing wisdom. Many people in business eager to get ahead picture themselves as go-getters. What does that mean? Many of us take it to mean that we are always looking for opportunities and pushing to take advantage of them. This book gives a little (but potentially life changing) different perspective. It is told anecdotally about a go-getter who has always been looking for ways to get business. Things aren't going well and the pressure is on to make a quarterly quota. Time is running out and Joe has to find some lever to help him reach his target. By chance he is steered towards a very successful man and he thinks maybe he can develop some leverage through this man. The contact represents a change in focus, although Joe is resistant and skeptical. Instead of getting some support in his strategy, a new way of approaching business is suggested. Gradually you as the reader (and mostly identifying with Joe) realize the title of the book comes from not getting business, but more giving business. Joe is, over a period of 5 days given 5 laws of Stratospheric Success. This is not just a theoretical discussion as he is expected to put each law into action before the next day. He is skeptical as are most readers. Gradually although the story might seem a bit unrealistic, you start to realize you do know of people who live this way and they are not only successful they are enjoying life more than the rest of us. The five laws are of value, compensation, influence, authenticity and receptivity. They are not difficult, but you really should read the book. It won't take you very long and it comes in easy chunks. There is a wisdom that you can apply to get more out of business and your personal life. For those who need more encouragement (or excuses) I will explain a little further. The essence of their belief is the first law of value. Your worth is determined by how much more you give in value than you take in payment. We are all familiar with the complaint that a worker won't do something because "they won't pay me what I am worth." The truth is we all want to buy more value than we have to pay, although we will accept (if we don't have time to look elsewhere) equal value. As buyers we all want to get as much value as we can for as little cost as possible. It makes sense that if we are trying to sell something (our services for instance) we need to offer a lot of value and if we don't understand that we will lose to those who do understand it. The other four laws logically fit the first premise. The author dances around with the expected criticism that being nice doesn't always pay. My own suspicion based on my experience is that there certainly are a lot of people looking to take short cuts to success or have a different definition of success (based more on money and power). Another underlying view I have accepted (via Sharon Drew Morgan) is that in fact sales people will do better if they realize they are servants. It is only by serving the needs of customers that we will be accepted as sales people. I think the views are compatible. There are a few plot twists, but they serve to make a point. The story is very easy to read and pulls you along painlessly. It takes a strong person to go against common perceptions. It starts with a strong understanding of values. The Go-Giver is a simple story that will deepen your understanding. I plan to hunt down an earlier book by Bob called "Endless Referrals". Thanks to Art Dyck for drawing my attention to this book and to Bob Burg. For many North Americans their experience with Bollywood consists of stumbling on a movie while playing with their remote tv control. They might come across something that gets their curiosity such as frantic staged musical dance scene or maybe some improbable wild action. After their initial curiosity subsides they get back to their regular program (which they might have left at a commercial break or between quarters) and mostly forget about the weird interlude. When they think about it they mostly think those other people sure are strange. India's population is much bigger than Canada and the United States combined and produces many more movies. The masses tend to fall into a general patterns. In North America we not only cater to our masses where the chance to make the most money is, but because we are so sophisticated (in our minds at least) and diverse we also have what might be called art films or serious films. So does India. They really do have some sophistication and some diversity (several languages spoken by more people than the whole population of Canada) and film makers are able to find an audience for a different brand of films. They also have an immense audience around the world because of the Indian diaspora. More than that they have attracted the attention of millions more of non Indians in Africa, Asia, Europe, Latin America and even North America. I would like to suggest a few movies I have enjoyed that don't fit the Bollywood stereotypes and might help provide a bridge for others. The first, "Dor" was brought to my attention by @bollywoodfanmia who is a non Indian living in Oregon. There is music in it, but not the dance sequences you saw while channel surfing. Actually there is a short snippet of dance, but it is similar to someone singing in the shower and really adds to the story (a pleasant memory leading to guilt feelings). The story is based on two women (the romance is dispensed with at the beginning). They come from different parts of India, of different religious backgrounds and have a conflict that only one of them is conscious of for most of the movie. More importantly they share a woman's perspective in a world not fair to women. The drama makes a point including that things may be changing and that human spirit can overcome all sorts of obstacles. Coincidently shortly after viewing this I came across another movie by the same writer/director, Nagesh Kukunoor and enjoyed it, but wish to discuss it in another blog. I am turned on by the director/writer and have reserved a third movie at the library. Learned of a most recent effort that will soon be ready. Not a prolific writer/director with the big budgets, but with a message for the world. Another movie I would suggest has a familiar story to it, but with a twist. Many of you may have seen the movie, "The Miracle Worker", the story of Helen Keller. An Indian producer took the story and put a twist on it and called it "Black" as that is how the heroine knows the world. This version is mostly in English with a few subtitles that will make it easier to identify with. The two main actors, Rani Mukerji and Amitabh Bachchan are each very good (if you see them in other more typical Bollywood movies you will be amazed at their versatility). Music plays a role, but more background. In some places it is certainly melodramatic and creates a mood that resonates with the dramatic message. One scene uses music in an unexpected way. Blind and deaf the heroinne lets us know she feels music and that is uplifting. The movie illustrates the strength of the human spirit. 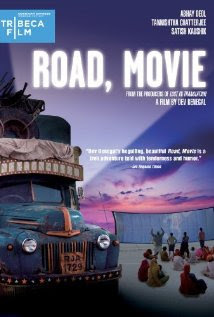 "Road, Movie" will give you a different concept of India. We see India as mostly big poor cities (with rich enclaves) or villages based on agriculture or mountainous regions. This movie takes us through a desert. The movie shows a maturing process. The hero played by Abhay Deol is a youth unhappy with his lot in life (does that some familiar?). He grabs an opportunity to drive an old truck through the desert to the ocean where his family can get some compensation and he can get some boredom relief. Along the way he picks up some unusual company that affects his view of life. A young boy, an older man with mechanical talent and a younger gypsy woman. They discover an old film projector and some movies. As one character says, movies have the ability to take away "life's pains" at least temporarily. You see some clips that you might recognize as early Bollywood successes. There was also what I thought was an American or European silent comedy clip. Indeed you see an outdoor audience laughing and enjoying the entertainment. You also see a change in the hero's outlook. Two actors that usually play character roles were Satish Kaushik and Tannishtha Chatterjee. I am as guilty as anyone of stereotyping. When dealing with "weird" outsiders it allows us to comfort ourselves with our superiority and an excuse not to waste time trying to understand things that just aren't worth the effort. I have come to enjoy some of what might be considered Bollywood stereotypes, but appreciate even more that there is a diversity with much of value to anyone willing to make the effort to explore.